I think by now most people have heard of Dosh. Although perhaps the Aussies haven’t heard much about it yet because the app is not yet available in Australia. However, it has been huge and there has been lots of excited chatter on social media about Dosh. What is Dosh, and is Dosh legit? The idea behind Dosh, is that you spend money anyway, so why not get some cash back? If you shop any of the participating stores, via the online offer site of Dosh, you ‘earn’ every time. It’s less about ‘earning’ in my view and more about just receiving some cash back – the amount of which you are aware of at the time you purchase the product or service. Dosh offers are found in the app and will receive cash back when you pay with a card that is connected to the app. You can get paid to travel, to eat at your favourite restaurant or shop online. What you do is go to the Dosh online offer tab to see the online offers and select your store. There you will see valid online offers, the specific discounts available, and any restrictions associated with the offer. You need to complete the purchase through the Dosh app during the same session, so that Dosh can track your purchase for your cash back. You will know that you’re shopping through Dosh because the screen will be frame in purple. Your purchases are tracked via the Dosh app link. 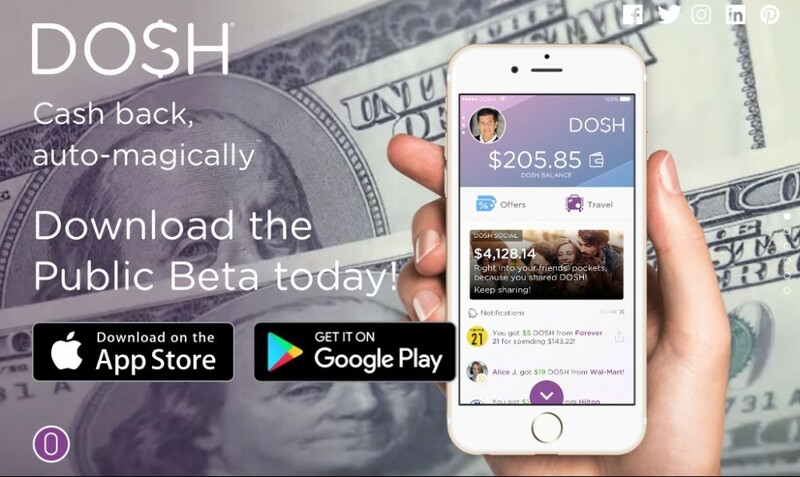 Dosh have a referral program (essentially an affiliate program) in place that earns you $5 for all new referrals you introduce to Dosh via your affiliate link who download the app and link a credit card. If you refer someone to Dosh, but they don’t use your link and go direct to Dosh then you do not receive the referral bonus. You will receive a notification if your referral downloads Dosh and still needs to link their credit card. This situation does not lead to a referral bonus for you unless they link their credit card. You will receive a successful referral notification only when you get paid for the referral bonus. 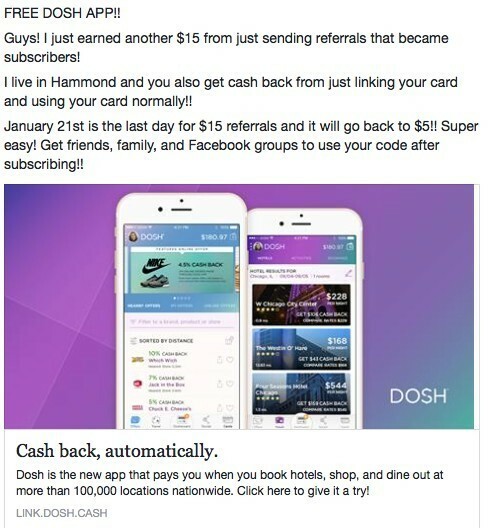 Dosh sometimes do a boosted bonus referral program, where they increase the referral fee for a period. They did this for their New Year’s referral program that went from 7 January to 21 January 2018. 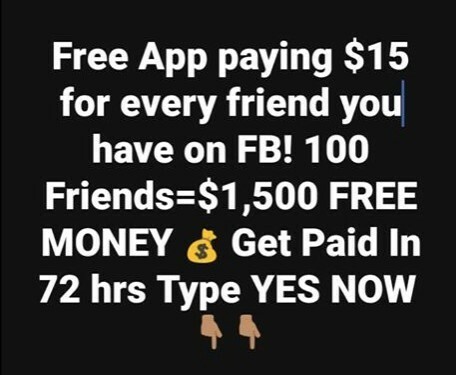 During this period, the referral incentive was $15 rather than the usual $5. It is easy to refer people to Dosh for your bonus. You can text a link to people using the ‘social’ icon. You then tap the image which contains a referral link, hit the ‘text’ icon, then select the people you want to share it with, tap ‘invite friends’ and then add a personalised message to get your family and friends to enrol. Hit send. Easy! Another way to get dosh referrals is to post your link on social media, explaining Dosh and the benefits that people get from Dosh, and inviting your followers to join using your link. Dosh seems to be growing at a rapid rate so downloads are happening left, right and centre. As a result, Dosh limit the number of new downloads / sign-ups per day. 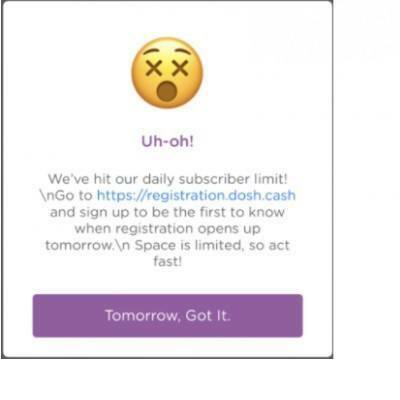 When Dosh have reached their download limit for the day, your referral will see a link to a waitlist that they will need to add their information to. They will be then be notified when they are able to download the app again. With Dosh, you don’t need to scan receipts, or use promo codes. They actually make it pretty easy for you to get your cash back. 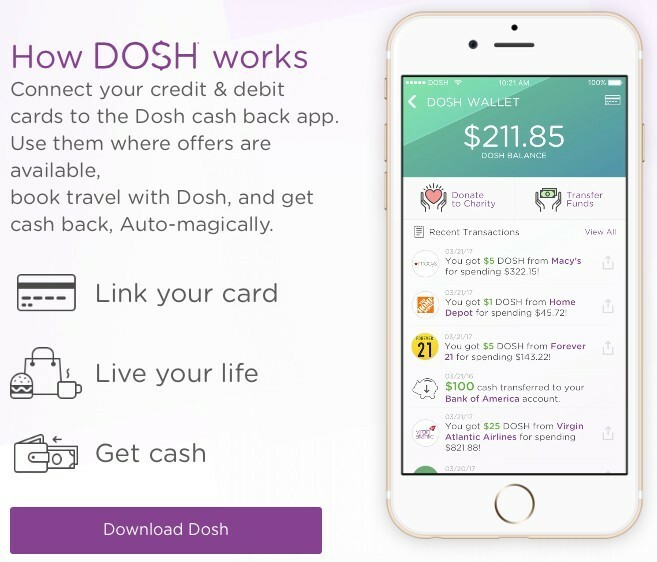 You need to link your credit card, and Dosh will automatically put any cash back into your ‘Dosh wallet’. It is rated well in the app store, with a 4.7 out of 5, based on almost 40,000 ratings. Are we all Doshed out? Lots of people have been jumping on the Dosh bandwagon, and if you don’t mind asking your family and friends (and pretty much anyone you’re connected with on social media), you can make some decent pocket money. It seems that the affiliate part (or the Dosh referral program) has died down a little because it did seem to be absolutely everywhere I looked for a while. There will still be money to be made in referring people to Dosh if that’s your thing. And referrals aside, it is actually a great way to get some cash back for yourself on products if you are going to purchase them anyway. Dosh – Scam or legit: LEGIT! 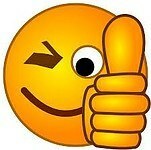 For pocket money, Dosh is great. You get cash back on products that you will be buying anyway, and if referrals are your thing too then you might get some money from referrals. If you are wanting a true online career from home rather than pocket money, there is a better way. For a real and long lasting career that you can build and grow over time, affiliate marketing is the place to be. Want more than just pocket money? Please leave me a comment or a question and I’m more than happy to help.